Precast construction is a process where concrete is casted in a reusable mold or ‘form,’ which is then cured in a controlled environment and is transported to the construction site for installation. There are different types of precast construction systems for architectural application purposes. They differ in size, function, and price. The usage of precast elements eliminates the need for conventional formworks. Precast elements also mitigate the amount of waste generated and check other environmental hazards. They further provide a safe working platform to workers. Precast products are manufactured in a casting area where critical factors, such as temperature, mix design, and stripping time, can be closely checked and controlled. This ensures that the quality of precast products is better than that of cast-in-situ concrete products. Additionally, precast products help in saving a significant amount of money by eliminating rectification work. Furthermore, due to a factory-controlled environment, different combinations of colors and textures can be applied easily to architectural or structural pieces. Precast concrete is primarily used in the construction of buildings with repetitive designs and elements, such as schools and apartments. It provides architects with an exciting medium while designing facades for a wide range of buildings, such as health care facilities, commercial buildings, and stadiums. Rise in investment in the building & construction industry, owing to various government-backed welfare housing schemes has boosted demand for precast construction during recent times. In addition, factors such as an increase in disposable income and a rise in the purchase of houses have propelled demand for precast construction. Furthermore, rebuilding, refurbishing, and renovation of old buildings have boosted investments in the building & construction industry, thereby augmenting demand for precast construction. Low interest rates in housing have also led to investments in the building & construction industry, thus propelling demand for precast construction. Key players profiled in the precast construction market include LafargeHolcim, China National Building Material Company Limited, Elematic Oyj, Cemex S.A.B. de C.V., CRH plc. Larsen & Toubro Limited, Taisei Corporation, Coltman Precast Concrete Limited, Bison Manufacturing Limited, and Weckenmann Anlagentechnik GmbH & Co. KG. These players engage in collaborations, mergers & acquisitions (M&A), geographical expansion, and launch of new products. In March 2017, LafargeHolcim Ltd. inaugurated a new Construction Development Lab (CDL) in Casablanca, Morocco to strengthen its position in the country. The facility would provide the company an edge over other market players through research and development. In terms of structure system, the floor & roof system segment constituted a major share of the global precast construction market in 2017. Floor & roof systems enable large span capacity, besides providing excellent sound transmission and heat resistance characteristics. They provide load distribution properties and are ideally used in garages, gymnasiums, paper mills, office & commercial buildings, industrial buildings (food processing industry, paper mills), condominiums, apartments, hotels, educational institutions, sewage & water treatment plants, etc.. They are also used as thermal mass to reduce the need for air conditioning. The floor & roof system segment is expected to expand rapidly, due to the high adoption rate of floor & roof systems in the precast construction market. In terms of end-use, the building works segment is projected to hold a dominant share of the global precast construction market during the forecast period. The segment is likely to expand at significant growth rate from 2018 to 2026. The residential segment, which is a sub-segment of the building works segment, is projected to expand rapidly during the forecast period. Precast construction offers diverse attributes such as low floor-to-floor height, deflection control, low noise transmission, involvement of high strength materials, and long spans. Such attributes are effective for the residential construction industry. Demand for precast construction products in the residential construction industry is expected to rise in the coming years due to direct cost reduction, improved constructional efficiency, and superior structural performance. 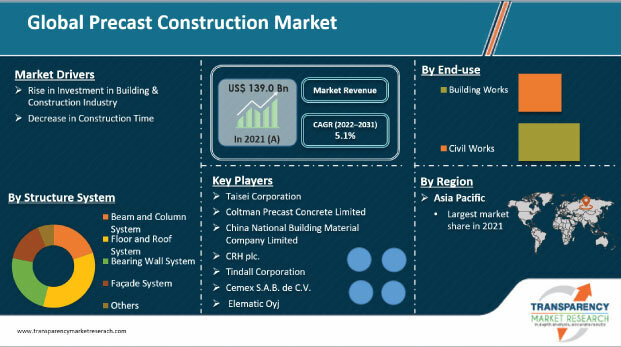 In terms of revenue, Asia Pacific leads the precast construction market, owing to a rise in investment in the building & construction industry, which can be attributed to a rise in industrialization and urbanization in emerging economies in countries such as China, India, and Japan. Factors such as government-supported welfare housing schemes have also increased demand for precast construction. Furthermore, a rise in activities such as rebuilding, refurbishing, and renovation of old buildings has augmented investments in the building & construction industry, thereby fuelling demand for precast construction in the region. Asia Pacific is a prominent region of the market, owing to the presence of a well-established industrial base in the region, which continuously requires investment. The report analyzes and forecasts the precast construction market at global and regional levels. The market has been forecast based on volume (Million Tons) and value (US$ Bn) from 2018 to 2026. The study includes drivers and restraints of the global market. It covers the impact of these drivers and restraints on the demand for precast construction during the forecast period. The report also highlights opportunities in the precast construction market at the global level. The report comprises a detailed value chain analysis, which provides a comprehensive view of the global precast construction market. The Porter’s Five Forces model has also been included to help understand the competitive landscape of the market. The study encompasses market attractiveness analysis, wherein various applications of precast construction have been benchmarked based on their market size, growth rate, and general attractiveness. The study provides a decisive view of the global precast construction market by segmenting it in terms of structure system and end-use. The segment has been analyzed based on the present and future trends. Regional segmentation includes the current and projected demand for precast construction in North America, Europe, Asia Pacific, Latin America, and Middle East & Africa. The report also covers the demand for precast construction in individual structure systems and end-use segments across all regions. Key players operating in the precast construction market include Bison Manufacturing Limited, Cemex S.A.B. de C.V., China National Building Material Company Limited, Coltman Precast Concrete Limited, CRH plc, Elematic Oyj, LafargeHolcim, Larsen & Toubro Limited., Taisei Corporation, and Weckenmann Anlagentechnik GmbH & Co. KG. These companies have been profiled in terms of attributes such as company overview, financial overview, business strategies, and recent developments. The report provides size (in terms of value and volume) of the precast construction market for the base year 2017 and the forecast between 2018 and 2026. Market numbers have been estimated based on structural systems and end-use of precast construction. Market size and forecast for each application segment have been provided for the global and regional markets. In-depth interviews and discussions were conducted with several key market participants and opinion leaders to compile the research report. Primary research represents a bulk of research efforts, supplemented by extensive secondary research. Annual reports, press releases, and relevant documents of key players operating in various application areas have been reviewed for competition analysis and market understanding. Secondary research also includes recent trends, technical writing, Internet sources, and statistical data from government websites, trade associations, and agencies. These have proved to be reliable, effective, and successful approaches for obtaining precise market data, capturing market participants’ insights, and recognizing business opportunities.